I should have mentioned this a while ago, but somehow I’ve been distracted. Last year I was contacted by my friend, Dr. Yesha Sivan, senior lecturer at the Department of Software Engineering, Shenkar College of Engineering and Design, Israel. I’d first met Yesha previously at SLCC 2008 and caught up with him again at SLCC 2009 in San Francisco. He inquired whether I’d be interested in writing a paper for his Journal of Virtual Worlds, a scholarly publication that contains a myriad of articles related to virtual worlds. This particular issue was to hold articles on Technology, Economy and Standards. In other words, which technical standard protocols could make virtual economies more vibrant? Yesha was especially interested in having me, an actual virtual business owner, provide an on-the-ground point of view not normally elucidated by academics. I agreed, and wrote up an article for the Journal, which was published in late 2009. I chose the topic: Barriers to Efficient Virtual Business Transactions, which really was a platform for me to rant about things that should be rectified. Like most virtual business owners, I encounter logistical problems so often that I and most others don’t even think twice about the insane work-arounds we constantly undertake. I tried to explain some of the basic ones, such has challenges to shared ownership of items and businesses, difficulties in advertising, permissions peculiarities and fulfillment follies. 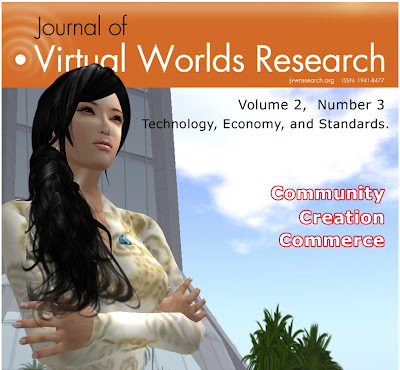 With the availability of business transaction capability within virtual worlds like Second Life, enterprising individuals and teams have established businesses that operate entirely within the realm of virtual reality. These wholly-virtual business operations act much like real-life businesses; they must develop and manufacture products or services, advertise, sell and fulfill deliveries. A complete lifecycle of business events takes place within the virtual world. The virtual business owner is presented with a seemingly complete set of tools to perform all actions required by each stage of the business lifecycle. However, over the past several years virtual business owners have begun to discover limitations and missing elements in these business transaction protocols. This paper will identify the more notable limitations facing today’s virtual business owners. Hopefully my thoughts are shared by other virtual business owners and I hope even more strongly that those charged with creating virtual worlds will resolve these issues so that much stronger virtual economies can emerge. I'd love to hear your feedback on the paper in the comments below. You can find the entire journal here, and my paper in particular right here (PDF). Enjoy!